The Franklin-Christoph Model 46 is a new design based on the smaller Model 45 but with a #6 size nib. It’s a sleek design with smooth lines tapering to flat finials. Uncapped, the barrel drops gently to a large, curved grip. Even though there’s a distinct edge between the barrel and grip, it’s not sharp and it doesn’t interfere with writing. The cap is clipless and is a bit shorter than other FC caps. I like this design choice because it suits the pen’s simple aesthetic and shows off the beautiful acrylic. Etched near the base of the cap is “Franklin-Christoph 46,” but the etching is so light you can barely see it except in bright sunlight. The top finial is etched with the FC logo. Model 46 currently comes in three colors: black, Autumn Oak, and Winter Pine (at the time of this review Winter Pine appears to be out of stock). Although I initially thought about buying Winter Pine, I decided on Autumn Oak. It’s a beautiful reddish-brown acrylic with flecks of gold and darker brown. The pen shimmers in sunlight and has depth reminiscent of celluloid. The pen is a cartridge/converter filler and comes standard with a Franklin-Christoph converter. As with most FC models, you can turn the pen into an eye-dropper by rubbing a little silicone grease along the threads. After a few disastrous “middle-age” moments when I unscrewed an eye-droppered Franklin-Christoph, spilling ink everywhere, I just use the converter. Pens like the Opus 88 that have built in rubber O-rings are much easier to use as eye-droppers in my opinion (it also helps if the pen happens to be a demonstrator). Regardless, the FC converter holds a good amount of ink and works really well. I chose a medium steel nib with a Masuyama stub grind for this pen. I’ve found that Franklin-Christoph’s steel nibs are every bit as good as their gold ones, especially when you get a Masuyama grind. The tines on this stub are perfectly aligned and the nib is decorated with beautiful scrollwork and a tasteful FC logo. I inked the pen with Diamine Autumn Oak, because, duh! I mean, if you have a pen that is called “Autumn Oak” why wouldn’t you ink it with Diamine Autumn Oak? I wrote with the Diamine ink for several days and was dissatisfied with how dry the pen wrote. I feared that perhaps the nib and feed were ink-stingy. I decided to switch inks to see if the pen wrote better. I chose Kyo-Iro Higashiyama Moonlight, and it made a world of difference. 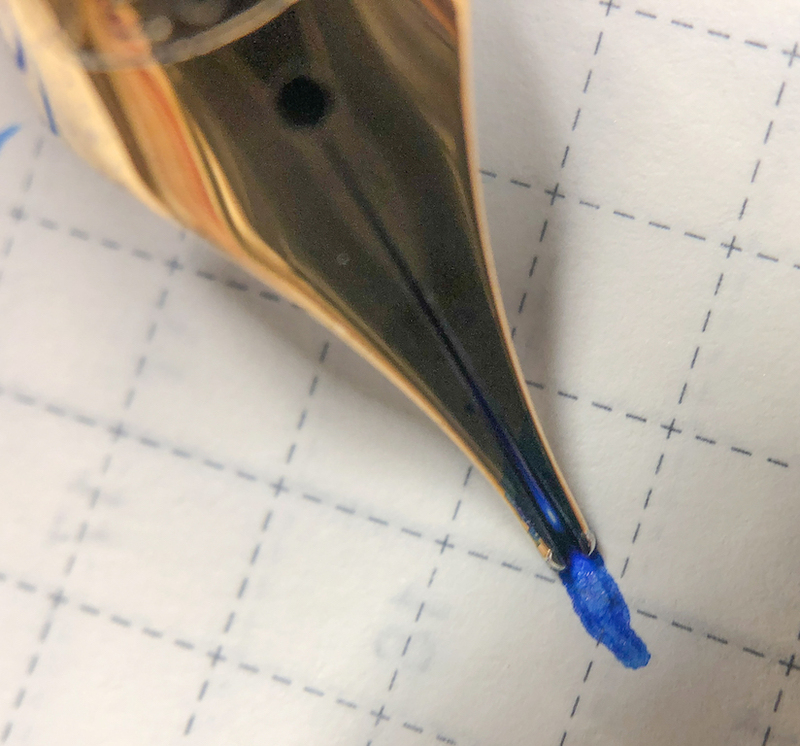 The nib writes wet and smooth with this ink. The Franklin-Christoph Model 46 is a medium/small-sized pen, measuring 5.25 inches/133.35mm capped, 6.65 inches/168.91mm posted, and 4.95 inches/125.73mm unposted. It is the smallest member of my FC collection (I don’t own any pocket models). I am quite pleased with the Model 46. It has a distinct shape and style that sets it apart from my other FC pens. It exudes typical Franklin-Christoph quality, and the color is exquisite. You can purchase a Model 46 from Franklin-Christoph with a regular steel nib for $150 (music nibs cost $10 more). With a SIG nib, the pen costs $165, and with a Masuyama nib, the cost is $175. This model with a gold nib costs $240. Posted on March 15, 2019 by Susan Pigott and filed under Franklin-Christoph, Fountain Pens, Pen Reviews. I’m going to use a term to describe the Franklin-Christoph Pocket 20 fountain pen that I don’t use often enough in product reviews: Useful. This pen is useful, for many reasons I’ll get into below. Useful is a positive term in my mind, although some may not consider it very exciting. Stationery goods being useful is what keeps me coming back to them time after time. My first F-C Model 20 was the full-sized Marietta, which was launched before this pocket-sized version. It has a classic, clean, shape and design, with its main feature being a slip cap, as opposed to the more common threaded cap. For those who don’t like threaded acrylic barrels, this keeps the grip section clear of any interference from threads while allowing for secure capping and posting. My first thought was how secure could this be? The last thing I need is the cap of my fountain pen popping off and getting ink everywhere. I have to say, this slip cap design is as secure as any threaded cap I own. I’ve never grabbed any of my Model 20 pens from a pen case, backpack, or pocket and felt even the slightest bit of looseness in the cap. It has proven to be rock solid, and even unique when compared to most of my other fountain pens. That uniqueness doesn’t come without surprises though. One main feature of Franklin-Christoph’s fountain pens - and a big reason why I like them so much - is their ability to be used as an eyedropper barrel, as opposed to using a cartridge or converter. With a little bit of silicone grease, the ink capacity of the pen can be increased exponentially. With either of the F-C 20 models, that can be an issue. Out of habit, I want to twist open most of my pens. Hand this pen to a friend, and they will want to do the same. The slip cap requires you to pull the cap off the barrel. If you - or anyone else - gives it a good twist, you will unscrew the grip section from the barrel. And if the pen is eyedroppered, guess what? Ink everywhere. If you own a Model 20 or Pocket 20 I can guarantee you have either done this already, or have come perilously close. Eyedropper filling a fountain pen is useful for ink capacity, and downright fun. You don’t HAVE to eyedropper the Pocket 20 pen - it takes short international cartridges - but I think you are missing out by not doing so. Look at the ink sloshing around the barrel! And yes, it is as easy to clean as any other pen. The Pocket 20 is useful because of its size. It fits anywhere, and goes everywhere. That’s why I love small fountain pens so much. Toss them in a pocket and go. I primarily use this model unposted, but the slip cap posts securely on the back of the pen for a full-sized writing experience. I opted for the clip on this model, since I normally go clipless, to mix it up a bit. Plus, I preferred the aesthetic. Nib choice is another area where I find this pen useful. I bought this now-discontinued model from Wonder Pens and was able to choose a 1.1 mm steel stub nib. I own many Franklin-Christoph fountain pens, and like to have many different nib sizes on hand to try out different things. Having options makes this pen more … useful. The Pocket 20 exemplifies everything I love about Franklin-Christoph. It is well-made, works perfectly, looks amazing, and is fun to use. I can load it up with fun inks to play around with, and swap in a nib to match my needs at the time. I wish I could get this much usefulness out of every product I own. Posted on December 17, 2018 by Brad Dowdy and filed under Franklin-Christoph, Fountain Pens, Pen Reviews. I am on a Holy Grail search for the best modern flex nib. I realize I am doomed to fail, as modern nibs just can’t match vintage ones, but, like Don Quixote, I like to dream impossible dreams. I did a review of the Aurora 88 Anniversario with flex nib back in March 2017. If you remember that review, I wasn’t much impressed. But, because I am a nutcase, I became obsessed with owning the blue Aurora 88 Anniversario in spite of the fact that I wasn’t impressed with its flex. I believe I bought the last blue Aurora 88 flex on earth. Isn’t it gorgeous? I purchased a Pilot 912 with FA nib a long while ago and reviewed it here. It’s a great pen, and I love the FA nib. And, recently, I purchased a Franklin-Christoph 14k SIG flex nib. I put it in my Iterum 03 reviewed here. Since I own three modern flex nibs, I thought it would be fun to compare them. I realize that various factors make this review less than scientific. First, I used different inks in each pen, and ink can affect line width due to variances in viscosity and saturation. But, I used different inks mainly so I could more easily distinguish the pens. Second, although I tried to use the same pressure with each pen, there’s no way to guarantee exactitude with the human hand. The Aurora, in particular, required quite a bit more pressure to get some flex. Third, the three nibs are quite distinct though all are made of gold. The Aurora nib relies on the flexibility of long tines to create line variation. The FA nib and the Franklin-Christoph nib both use cutouts to increase line variation. I compared the nibs with various writing tests. First, I did swirls. 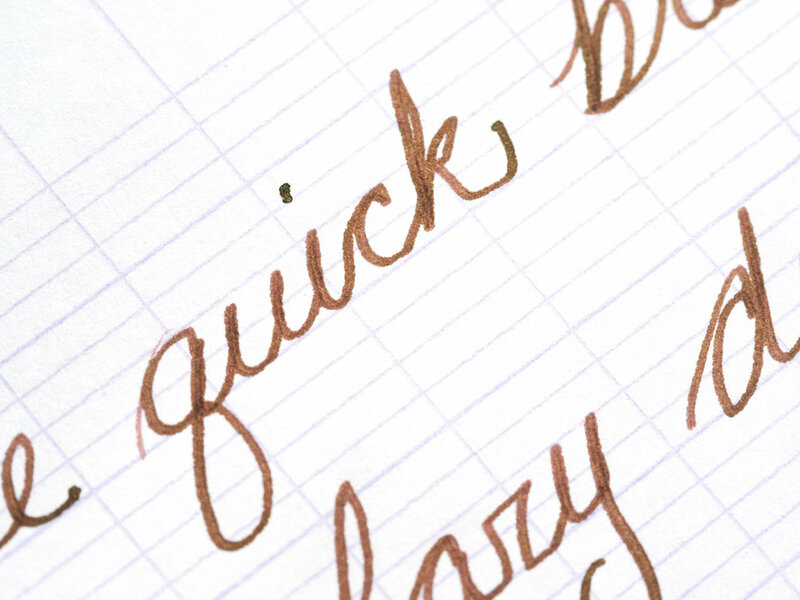 In this test, the Pilot 912 with FA nib definitely showed more line variation. The Franklin-Christoph SIG flex nib came in second with good line variation, and the Aurora was last with the least line variation. Plus, the feed didn’t keep up with the flex resulting in railroading. In the third test, I simply drew vertical lines while flexing the nib. Once again, the Pilot provides the most flex, measuring a little over 1mm, but the Franklin-Christoph and Aurora were pretty similar, both just under 1mm. After comparing these three modern flex nibs, I have to give first prize for line variation to the Pilot 912 with FA nib. This nib simply flexes more easily and with more line variation than the other two nibs. The Franklin-Christoph SIG Flex Nib gets second place. Not only is this nib a pleasure to write with, it offers good line variation and the nib can be used in any Franklin-Christoph pen that accepts a size #6 nib. 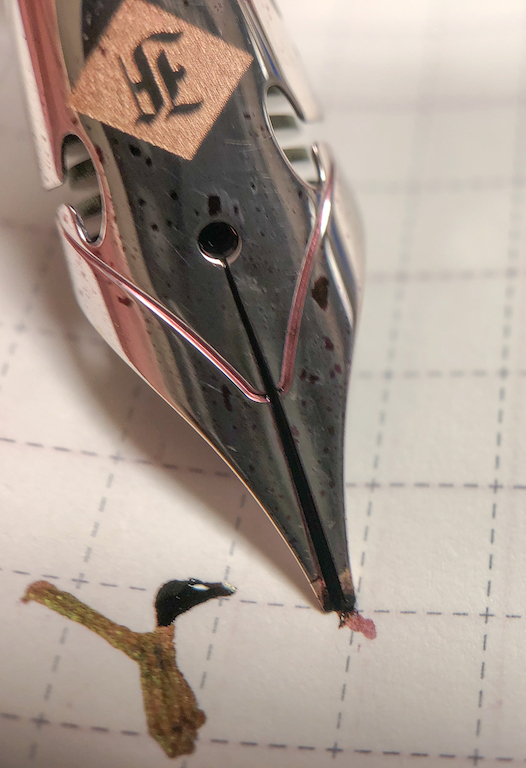 Unfortunately, when I use my FC SIG flex nib for regular writing (such as when I’m taking notes in class), it has a tendency to dry up and require a little tongue lick (I know, gross) to get the ink flowing again. Still, I love the bounce that the cut outs give, and the pen itself is light and easy to write with. In third place is my very expensive Aurora 88 Anniversario. I just cannot get this nib to flex without putting lots of pressure on it. That said, it is my favorite pen of the three, mainly because it is a piston filler and it’s blue. What can I say? I love blue pens and Aurora nibs are incredibly well made. True, the Aurora struggles as a flex nib. Of the three, it was the only one that railroaded. But, as an every-day writer, the Aurora is excellent. After comparing these three modern flex nibs, my conclusion is that the Pilot FA nib is the best nib for creating line variation using flex. If you want a more interesting pen design, then I suggest you go with any Franklin-Christoph model that accepts their #6 SIG flex nib. I still cannot recommend Aurora’s flex nib if you want excellent line variation. It simply requires too much pressure and the feed does not adequately supply ink when you use flex (thus, the railroading). That said, Aurora is offering flex nibs in their newest Optima models. 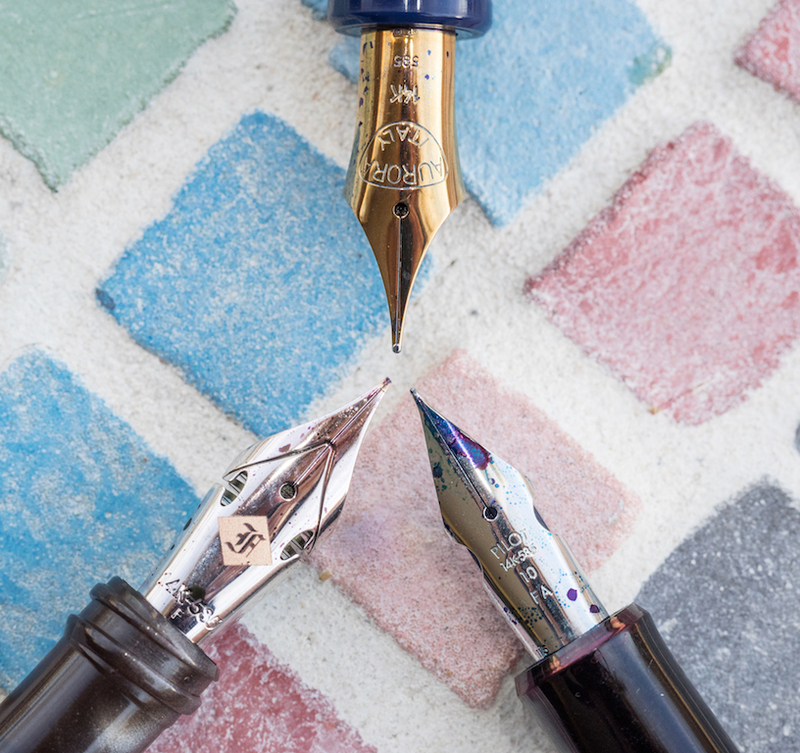 If you really want an Aurora flex nib, I encourage you to purchase one from Dan Smith. He can tweak the feed and nib for better flex and ink flow. 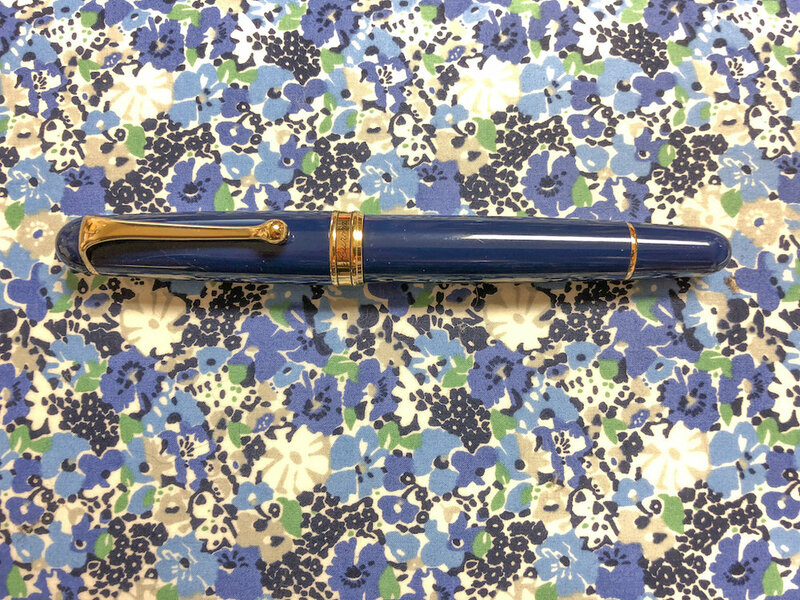 You can purchase the Pilot Custom Heritage 912 from Vanness Pens for $225.00. Although most (if not all) of the Aurora 88s with flex nibs are sold out, Optimas will be available in March (retail $650), and I suggest you contact Dan Smith to pre-order one of these. Franklin-Christoph offers numerous pen styles that accept the #6 SIG flex nib. Prices vary between models. **Author’s note: My comparison omits one other modern flex pen: the Wahl-Eversharp Decoband (reviewed here). In terms of flex, this pen surpasses all three of the pens I reviewed above. However, two factors made me decide not to include it in this comparison. First, it truly is an oversized pen, much larger (and heavier) than the three pens discussed above. Second, it is a great deal more expensive (retail $850) than the other pens, especially the Franklin Christoph and the Pilot 912. Please read my review if you think an oversized pen would suit you best. Posted on February 16, 2018 by Susan Pigott and filed under Aurora, Franklin-Christoph, Pilot, Fountain Pens.